The House Budget Committee displays copies of President Trump's new budget proposal on Capitol Hill on Monday morning. Presidential budget proposals are typically political documents, with Congress taking the lead to set federal spending levels. "In a time of $1 trillion deficits, we can no longer afford some of these activities," acting White House Budget Director Russell Vought told Morning Edition. The president's budget calls for a 23 percent cut in State Department funding, a 15 percent cut in spending by the USDA, and a 31 percent cut in the budget for the Environmental Protection Agency. The budget for Homeland Security would increase by 7.4 percent. "We need to continue to secure the country," Vought told reporters at the White House. "But at the same time, we're also going to say that we have many, many programs that are wasteful and inefficient that we can no longer afford." Congress largely ignored previous Trump budgets, even when Republicans were in full control. That's practically certain to happen now that House Democrats have a shared grip on the purse strings. "What the administration is saying is we need to spend a lot more in defense, but things like education and job training and environmental protection and infrastructure are unimportant for the nation's well-being," said Sharon Parrott, a senior fellow at the left-leaning Center on Budget and Policy Priorities. "I think most in Congress are going to reject that formulation, and I certainly don't think it is one that is in the best interest of the American people." While the president's budget is unlikely to be implemented, the document does carry some weight as a signal of Trump's priorities. In addition to building the border wall, the administration wants to impose work requirements on programs such as food stamps, housing assistance and Medicaid. "We can help low-income families and end dependency on government benefits by strengthening work requirements," Vought said. In passing the Farm Bill last year, Congress rejected the idea of adding work requirements to food stamps. But the administration is working to impose the requirements on its own. "The research really shows that these requirements don't do much to improve employment outcomes and do a lot to increase hardship among people who are already really struggling," Parrott said. Trump promised during his presidential campaign to balance the federal budget. But instead, the deficit has ballooned on his watch as a result of increased spending and the GOP tax cut. The White House projects that the deficit will exceed 5 percent of GDP this year — unusually high for a country not mired in recession or widespread war. And despite the administration's rosy economic forecast, the red ink is expected to keep flowing long after Trump leaves office. "Even under really heroic economic assumptions, the savings in this budget aren't enough to put us on a really sustainable path," said Maya Macguineas of the Committee for a Responsible Federal Budget. "It would still have very large budget deficits at a time when the administration is assuming very strong economic performance." President Trump is calling for a big increase in defense spending next year - another $8.6 billion to pay for a wall along the U.S.-Mexico border and deep cuts to many domestic programs. 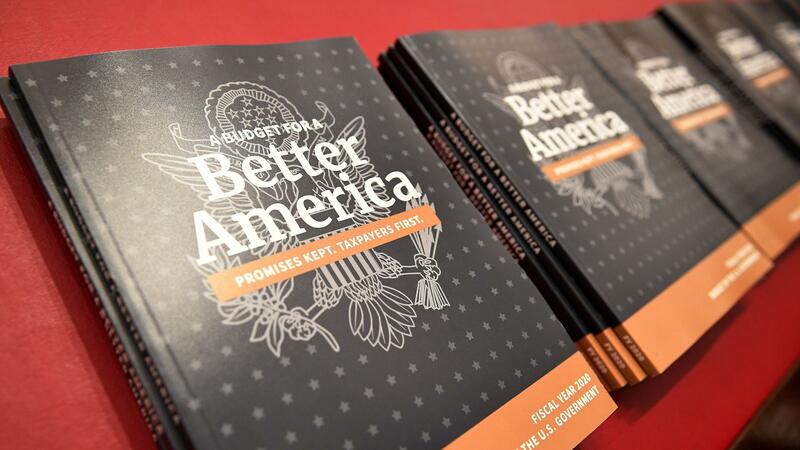 That's all in the blueprint for the annual budget that the White House released today. Lawmakers are not likely to adopt many of the president's suggestions, but the document does offer a guide to Trump's priorities. NPR's Scott Horsley reports. SCOTT HORSLEY, BYLINE: President Trump wants to boost defense spending by $34 billion, or nearly 5 percent, in the fiscal year that begins in October. Trump also wants to increase spending on Veterans Affairs and Homeland Security by about 7 1/2 percent. The president would partially offset those costs with deep cuts elsewhere in the federal budget. Acting White House Budget Director Russell Vought says in a time of trillion-dollar deficits, tradeoffs have to be made. RUSSELL VOUGHT: We need to continue to secure the country. We need to continue to secure the border. We're not going to be bashful about that. But at the same time, we're also going to say that we have many, many programs that are wasteful and inefficient that we can no longer afford. HORSLEY: The president's budget calls for a 15 percent spending cut at the Department of Agriculture, a 23 percent cut at the State Department and a 31 percent cut at the EPA. Congress largely ignored calls for cuts like that during Trump's first two years in office. And Sharon Parrott of the left-leaning Center on Budget and Policy Priorities says cuts are likely to be an even tougher sell now that House Democrats have a shared grip on the purse strings. SHARON PARROTT: Ultimately, what the administration is saying is we need to spend a lot more on defense, but things like education and job training and environmental protection and infrastructure are unimportant for the nation's well-being. HORSLEY: The White House budget also calls for cuts to programs such as food stamps, Medicaid, housing assistance and welfare. Vought says in order to qualify for those programs, able-bodied adults should be working, or else enrolled in job training or some other community activity. VOUGHT: We can help low-income families and end dependency on government benefits by strengthening work requirements. HORSLEY: Parrott notes that Congress rejected a bid to add work requirements to food stamps last year as part of the farm bill. But the administration is preparing to impose the requirements on its own. PARROTT: The research really shows that these requirements don't do much to improve employment outcomes and do a lot to increase hardship among people who are already really struggling. HORSLEY: During the campaign, Trump promised to balance the federal budget. But during his first two years in office, the deficit ballooned thanks to increased government spending and the GOP tax cut. White House economic adviser Larry Kudlow said over the weekend, deficits are nothing to obsess about, but Maya MacGuineas of the Committee for a Responsible Federal Budget disagrees. MAYA MACGUINEAS: Worrying about the deficit is not a popular concern right now, but it doesn't mean it's not an important thing to be worrying about. And we are clearly on the wrong path. HORSLEY: Even the administration's own forecast now projects trillion-dollar deficits in each of the next four years. And MacGuineas notes despite rosy White House economic projections, the red ink is expected to keep flowing long after Trump leaves office. MACGUINEAS: Even under really heroic economic assumptions, the savings in this budget aren't enough to put us on a really sustainable path. It would still have very large budget deficits at a time when the administration is assuming very strong economic performance. HORSLEY: MacGuineas does see some encouraging proposals in the White House budget, including plans to cut prescription drug prices and find other health care savings. MACGUINEAS: There are a lot of good ideas in this budget. And the problem is because it relies on gimmicks and unrealistic economic growth assumptions, they don't get treated as seriously as they otherwise should. HORSLEY: And the call for additional border wall funding suggests the budget fight that led to a 35-day government shutdown is far from over. Scott Horsley, NPR News, the White House. Transcript provided by NPR, Copyright NPR.